Life in Bangkok gets busy very quickly. The handyman actually showed up on Sunday and spent several hours installing pipe through the empty space above our ceiling, connecting the bathroom water supply with the balcony outside our bedroom. He’s to return this morning and finish the job so (and I think I’ve written this before) with any luck we’ll have the ability to wash our own clothes by dinnertime. Tawn left yesterday afternoon for an overnight business trip to Singapore. One of his clients, HP, is holding a press conference announcing some new development in the world of technology, and he is chaperoning some Thai and Malaysian journalists to the event. He asked if I wanted to go along, but it was such a short trip with no down time for him, so there wasn’t much of a point. Fortunately, I did have an opportunity to have dinner with Masakazu and his partner, Mitsu. Mitsu is now pretty much fluent with Thai, Masa is learning, and I’m still a beginner. An early beginner, at that! We had dinner at a really nice Laotian/Issan (Northeast Thai) style reastaurant in the Silom area called Cafe du Laos. The restaurant is in a lovely colonial-style 2-story house that is surrounded by skyscrapers. Service was attentive and the food was really nice. We had a version of somtum (green papaya salad) made with pomelo, a grapefruit-like fruit. Mmm… tasty. Also a beer-marirnated pork with spicy chili sauce. Speaking of skyscrapers, there are many condominium developments occurring here in the City of Angels. In the debate of whether or not to purchase a condo in the near future, I’m inclined to wait a bit because I see a lot more housing stock coming on the market in the next 2-3 years, which I would imagine should either drive down prices or at least hold them steady. The above picture is for a development that is just two blocks down the street from us called Millennium Sukhumvit. It will be about 500 feet from the Metro station, so the location is spectacular. There’s another development happening adjacent to our building, but to the north. The land has been graded and there are occasional bouts of activity, but true construction has yet to begin. Maybe they’re waiting for more phone lines to be installed! Well, only two days to go before Thai language classes start at Union Language School. Mitsu tells me that he has friends who have gone there and that it is quite reputable, but they actually assign homework and give exams, unlike American University Alumni Association, which he attended and Masa currently attends. 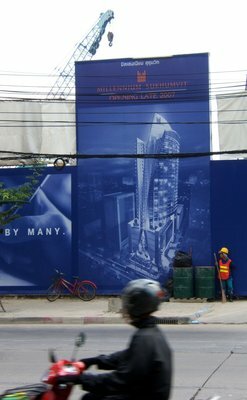 This entry was posted in Expat Life, Thailand and tagged Busy, Construction, Expat, Grand Millennium, hotel, Life, Sukhumvit, Thailand by christao408. Bookmark the permalink. I’ve never had Laotian food. Did you enjoy it? I think I’d have fun trying regardless.Just wondering, have you installed the necessary software for your computer handle Thai language yet? Aaron – I haven’t installed Thai language software on my computer yet since I don’t anticipate needing it anytime soon. Learning to read and wrtie in Thai will take a while. Once I get to the point where I’m actually usuing the language on a written basis, I’ll upgrade the language system. As for the Laotian food, it is very similar to Northeastern Thai style food. Some of the things you may enjoy at a local Thai restaurant in NY – green papaya salad, for example – are actually Northeastern Thai / Laotian. This restaurant in particular is one I’d recommend for you when you come here in December.